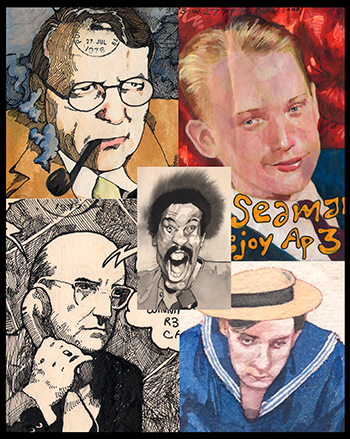 It’s the third Thursday of the month, the day that I post The Secret Stash on my Patreon page– that is, sketches, reference photos, old flyers, and other ephemera from my files. Today I have a selection of decorated envelopes sent to friends over the past four decades or so, specifically ones that depict famous people. Because there are so many of these, I split the pile up into male and female celebrities. This month it’s men; I’ll post envelopes with women at some point in the future.